The idea of having a place where visitors could interact with his characters in a fun and entertaining way was exciting to Jim. He visualized how a theme park could provide a home for all the different products of his soaring imagination. He could combine his ideas for live performance, film, design, music and comedy with audience interaction in an energetic and welcoming setting. In the late 1970s, he wrote up concepts for such a park – a food ride where the cars shaped like carrots and beets would travel into a mouth, get chewed in some fashion, enter the bloodstream and end up in a cell. There was the Five Senses Ride that went into the nose, eyes, ears and mouth, perhaps connecting with the food ride, allowing riders to send messages to the brain. Another ride might highlight different regions of the country and include an aural component where the visitor could hear regional accents. Jim thought about people traveling through time, seeing life on earth develop before them, or using his Muppet Show characters as guides on a trip through theater history, providing Nerf tomatoes to throw in the Shakespearean section. The possibilities were endless. By 1988, Jim had several themed activities going. His characters appeared in numerous parades and arena shows, the Sesame Place play park outside Philadelphia was a popular destination for families, and the Muppets taught traffic safety in an animatronic show in shopping malls. 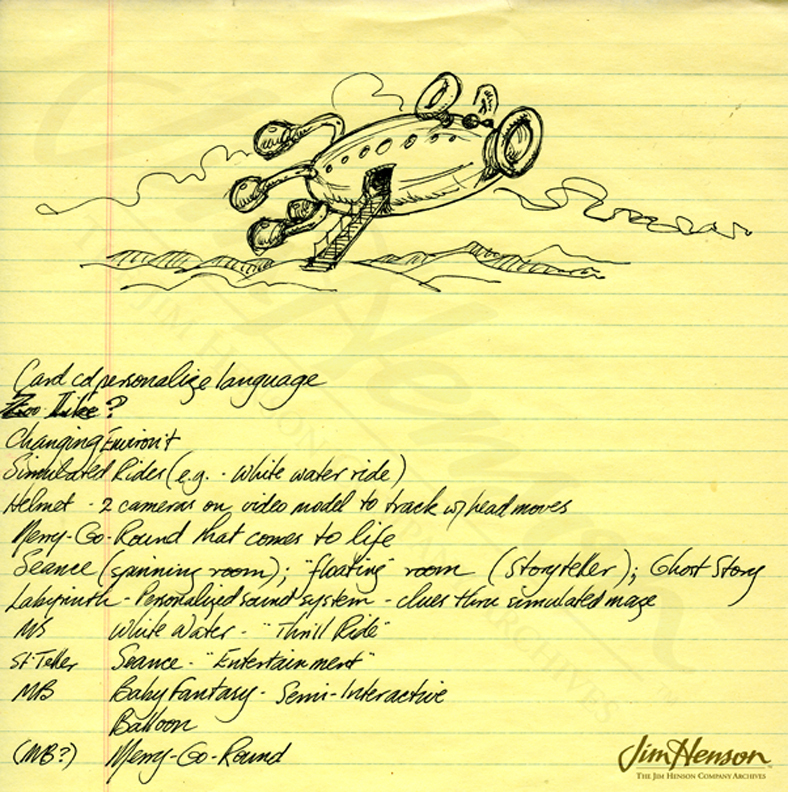 Jim’s creative team had a series of meetings about what might be in a Henson theme park. The goal, according to one memo, was, “…an interactive, cinematic experience that elicits audience participation.” New technologies presented all sorts of opportunities, and the group thought about having smaller locations in a network around the country, rather than one giant park, where visitors could interact with people at the other locations. For example, by using the Waldo technology developed for animatronic puppetry, two people in different parts of the country could have a real-time arm wrestling match. Jim invited various consultants in to discuss the project including Bran Ferren, an artist and engineer who worked with special effects and performing arts organizations and eventually went to work for Disney as an Imagineer. Various concepts were developed but within a year, Jim began negotiating to sell his company to The Walt Disney Company and plans for a Henson park were suspended. From the start, Jim felt that the Disney parks were the best, and he was thrilled to sign an agreement on August 25, 1989 that would put the Muppets into Walt Disney World. 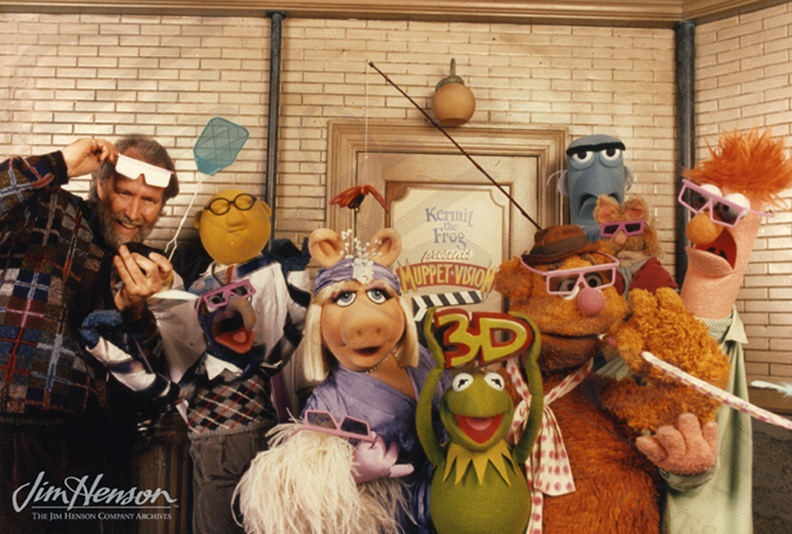 On June 15, 1990, the live show Here Comes the Muppets premiered there, and on May 30, 1991, the interactive, cinematic Jim Henson’s Muppet*Vision 3D opened and continues to entertain audiences today both in Orlando and at Disneyland in California. 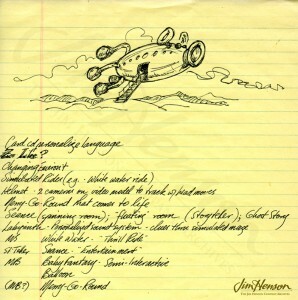 Jim’s concepts for rides in a Henson theme park, 1970s. 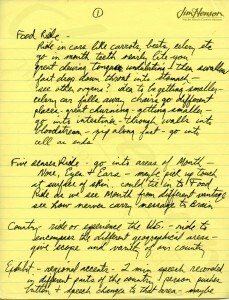 Michael Frith’s theme park notes, 1988. 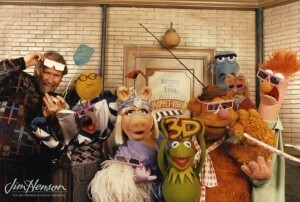 Publicity photo for the opening of Jim Henson’s Muppet*Vision 3D at Walt Disney World, 1990. 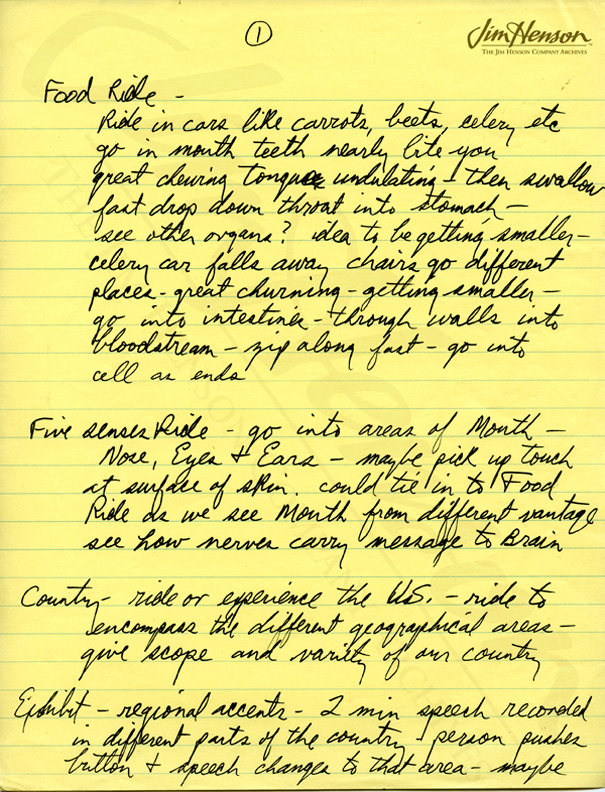 This entry was posted in 02-February '88, 1988 and tagged Here Comes the Muppets, Muppet*Vision, theme parks, Walt Disney World. Bookmark the permalink.